Yes, the big boys like Gizmodo and Engadget get to have all the fun, don't they? Yesterday, Gizmodo got their grubby little paws all over a new MusicGremlin. Now, the Engadget Mobile crowd has managed to somehow snag some facetime with the Motorola phone code-named Canary. Well, you're more likely to be impressed by if I call it by its "unofficial" nom de plume, the RAZR 2. So what's different? Well, for one thing it's blue . Crazy . Moto's switched up the proportions too; the Canary looks to be a little narrower in width and a little thicker in height/depth. 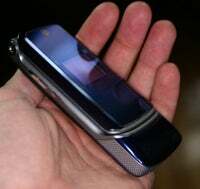 The changes in size remind me more of my retired Motorola V60 (a phone which was, in its day, pretty awesome). They've also redone the keypad slightly, though it keeps its flat metal look. From the brief shots, the UI looks to be the standard Motorola interface. Overall, it looks pretty swank. Perhaps I'll be in the market for a new phone by the time the Canary makes it to market at a reasonable price.